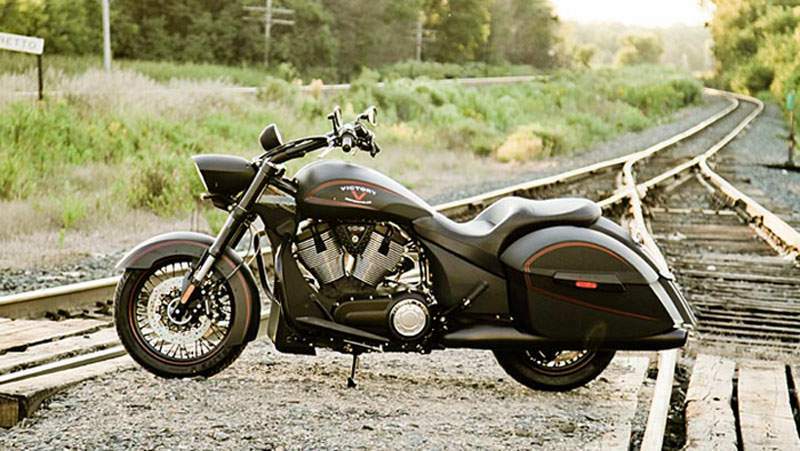 Joining the High-Ball in Victory’s expanding stable of models is the 2012 Hard-Ball. The black-as-night iteration of the High-Ball’s ape-hanger profile brings a touch of touring convenience with the addition of saddlebags. 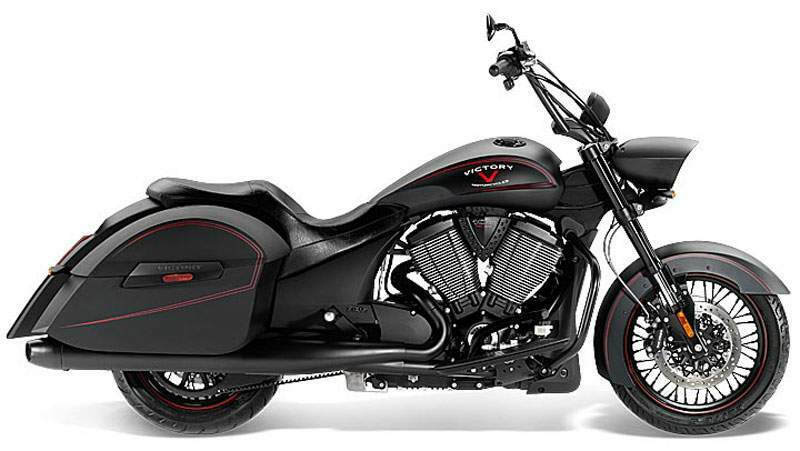 In addition to the black and pinstriped luggage are obvious additions such as the two-person seat, crashbars, floorboards, lower fairing and split exhaust. 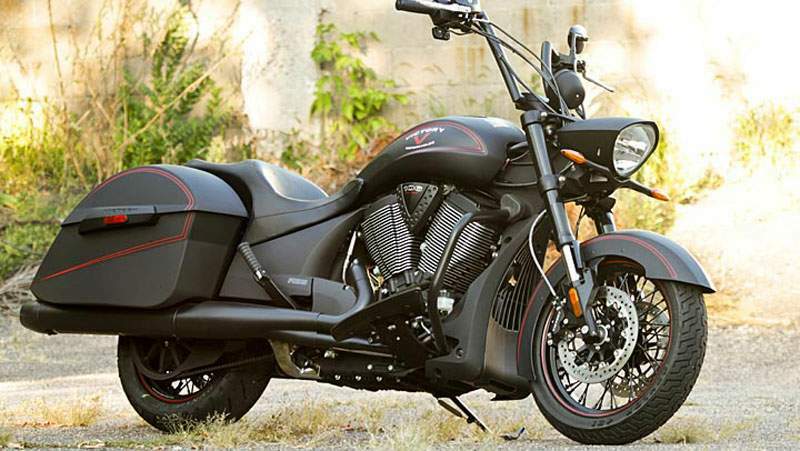 Not as immediately apparent are some of the changes Victory incorporated into the Hard-Ball to better suit its longer-mileage persona. The re-styled fuel tank holds 1.3 gallons more petrol, and the wheels, while still spoked, increase in size as well. The front grows in diameter to 18 inches, from 16 inches on the High-Ball, and carries a 130/70 R18 Dunlop 491 Elite II, while the rear grows in width from 3.5 inches on the High-Ball to 5.0 inches on the Hard-Ball wearing a 180/60 R16 Dunlop Elite 3. The span between wheels grew by nearly an inch to 65.7 in from the High-Ball’s 64.8 in. Rake and trail figures are more relaxed, 29.0° / 5.6 in vs 31.7° / 6.7 in, weight increases by 92 lbs (dry), and so does ground clearance by 1.1 in. Seat height, at 26.25 inches, is 1.25 inches higher the High-Ball’s. Up front the the Hard-Ball features an inverted fork and gains a second brake disc while the braking system is of the ABS variety. Engine and drivetrain remain unchanged from the High-Ball model. At the heart of Hard-Ball sits the Freedom V-Twin power plant, expertly balanced for perfectly controlled explosions that deliver 97 horsepower and 109 ft. lbs. of hole shot torque. Maestro of the motorcycle world, it's what keeps man, machine and highway working together in perfect harmony. Make a statement with two fists in the air. These blacked-out apes are what give the Hard-Ball its signature profile. Feel a little less simian? Pull 'em down low for a more relaxed, but no less intimidating riding position. 21 gallons of hard bag storage allows you to hit the road for as long as you want. You'll have plenty of cargo space for yourself and another rider's carry on if you choose to leave the solo gig behind. Standard on the Hard-Ball, the Victory Anti-Lock Brake System doesn't discriminate between dry, wet or rock-strewn pavement. ABS is not for sissies, it's allowing you and your Hard-Ball to own the road more than anyone else. No matter the conditions, ABS monitors what the wheel is doing and gives you consistent, smooth braking from the handlebar lever down to the rubber on the road.